Two enchanting games, one great price! Build the heart of Ancient Rome and become its Emperor! This legendary city was one of the most beautiful and powerful capitals of the ancient world. Now you can bring back all of its masterpieces! The Coliseum will become a good training school for your brave gladiators! The Pantheon - Temple of the Roman Gods - will bring you luck! The fabulous land of Caesar opens its gates before you in this engaging puzzle game. Build the mysterious heart of Ancient Persia in this engaging puzzle game! The original capital of the Achaemenid Empire was adorned with luxurious metals, gems and stone carvings, but its exotic gardens and impressive architecture have long since vanished in the passing sands. Now you’ve got the chance to solve the riddles of these ruins as you travel through the land of 1001 nights. 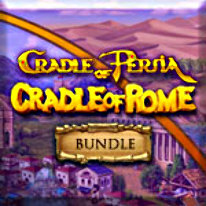 Unlock a mystery never before seen by man, here in the Cradle Of Persia.